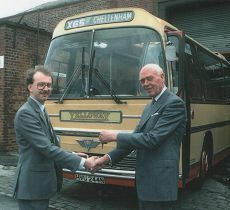 Preserving the memories of a unique motor coach company who provided a first class service and brought happiness and satisfaction to many thousands of people. 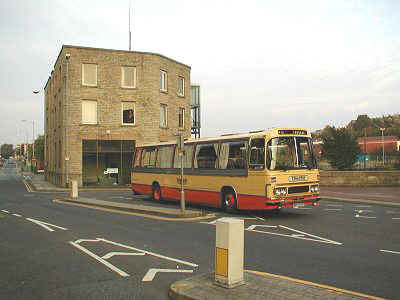 The mobile museum is seen above on it's inauguration in September 2002 outside the former Yelloway offices (now a listed building) at Weir Street, Rochdale, Lancashire, England. The large coach station and vehicle maintenance garage was situated on the right. motor coach companies in Great Britain. HVU244N to the Museum of Transport in Manchester. 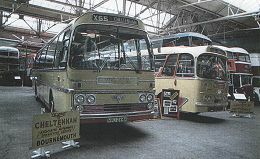 Harrington bodywork which Hubert had restored and donated to the museum in 1984.
reluctantly retired from his post in his 73rd year. 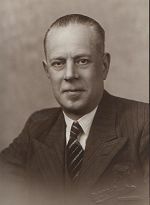 Hubert became Chairman and Managing Director of Yelloway Motor Services Ltd.
in 1956 after the death of his father Mr. Herbert Allen M.B.E..
Mr. Robert Holt, director of Holt Bros. (Rochdale) Ltd., in 1932.
suppliers of vehicles to the coaching industry. disappeared under a cloud of dust, a victim of greed and mismanagement. The late Hubert Allen O.B.E. JP. (1912-1994) was not only a gentleman but one of the last survivors from an era when a successful business was based primarily on care for people rather than an unhealthy blinkered obsession with the final figure on a balance-sheet. Yelloway Motor Services Ltd. reflected the personality of its Chairman and Managing Director; all staff felt that they were vitally important to the company and in turn expressed their pride in the company's reputation in their standard of service to their customers. Because of this bond between management and staff the Yelloway company operated as the 'Epitome of Excellence'. New management took the company over on Hubert's retirement but sadly they were not in the same mould. Soon the company's proud reputation sunk beneath the shame of a very tarnished image indeed.